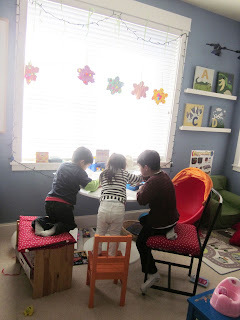 I thought I'd take a moment to share some of the changes we've made to our playroom over the past year as we embarked on our first year of homeschooling. 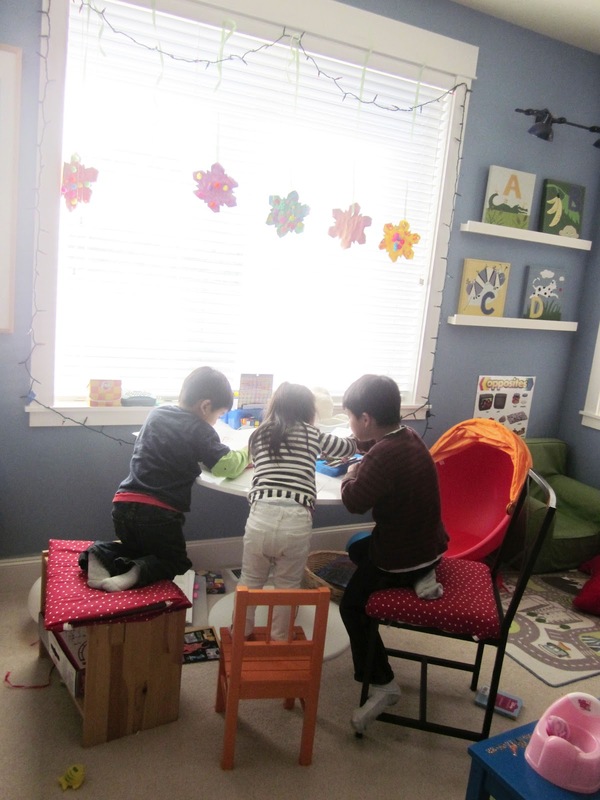 You can see what our playroom looked like before. The biggest change is that we took out the big toddler toys, a workbench and a kitchen. I was sad to see those things go because it meant the kids were growing up, but I have to admit, the moments that we experience in our classroom/playroom now are so much richer. Sure, there's been plenty of tears shed over not wanting to do school, feeling discouraged, or flat out having a bad day. But there's also been many priceless moments of excitment, incredible teamwork, accomplishments and creativity. Mission Control. Our main school wall with our calendar, places to display projects, word wall and wipe board. All our papers, math manipulatives, and some toys are stored in the bins. Typical week... letter of the week with a verse of the week. Now, over my 10 years of teaching 3rd grade, I don't think there was a single year that I didn't move things around. So, this room will definitely be progressing and changing throughout the months and years!